East face of outer court yard, Man Mandir, Gwalior Fort. bl.uk > Online Gallery Home	> Online exhibitions	> Asia, Pacific and Africa Collections	> East face of outer court yard, Man Mandir, Gwalior Fort. 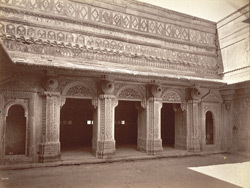 Photograph of the east face of the Man Mandir at Gwalior in Madhya Pradesh, taken by Deen Dayal in the 1880s, part of the Bellew Collection of Architectural Views in India. Gwalior in central India is the site of a magnificent fort, perched on a rocky plateau, which changed hands several times over the centuries. In the early 13th century, the fort passed from the Rajput Pariharas to the Sultans of Delhi. In the late 14th century Gwalior reverted to the Rajput clan of Tomaras, who asserted their independence from Delhi, and who were keen patrons of the arts and culture. Their rule resulted in one of the finest of Hindu palaces, the Man Mandir, built by Man Singh (ruled 1486–1516). It is located at the edge of the fort, overlooking the city of Gwalior. The exterior of the multi-storeyed palace is richly decorated with tilework, in bands of turquoise, green and yellow. The interior is more plain, consisting of apartments arranged around open courtyards. The royal apartments have pierced screens or jalis and decorated arcades.